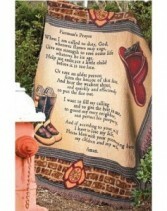 This beautiful throw states "Fireman's Prayer When I am called to duty, God, wherever flames may rage, Give me strength to save some life whatever be its age. Help me embrace a little child before it is too late. Or save an older person from the horror of that fate, And hear the weakest shout, and quickly and effectively to put the fire out. 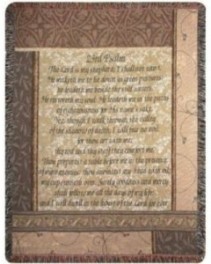 I want to fill my calling and to give the best in me, to guard my every neighbor, and protect his property. And if according to your will I have to lose my life, Please bless with your protecting hand, my children and my wife, Amen." Price point one is presented folded with a bow and card. Price point two is displayed on an easel and price point three includes flowers or a plant for an even more beautiful display. To increase the size of the flowers or plants please call the store at 419/529-9739. 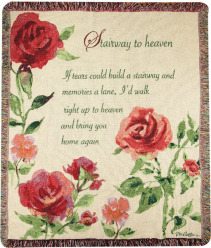 This beautiful woven throw is perfect for the loss of someone precious. Price point one is presented folded with a bow and card. Price point two is displayed on an easel and price point three includes flowers or a plant for an even more beautiful display. To increase the size of the flowers or plants please call the store at 419/529-9739. Price point 2 includes a display of flowers at the top or a plant placed at the base of the throw for an even more attractive display. The Spring Blooms by Kimberly Poloson includes these encouraging words, "I said a prayer for you today." 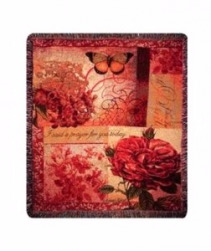 Rich red, mauve, and golden tones make the florals in this throw stand out in detail. Made of 100% cotton, the throw machine washable. Price point one is presented folded with a bow and card. Price point two is displayed on an easel and price point three includes flowers or a plant for an even more beautiful display. To increase the size of the flowers or plants please call the store at 419/529-9739. 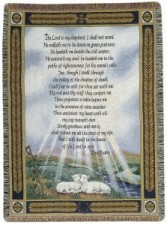 The light of the word from the "23rd Psalm" shines down on two innocent lambs in this throw. A border of blue, brown and gold surround the Bible passage, which is easy to read. Price point one is presented folded with a bow and card. Price point two is displayed on an easel and price point three includes flowers or a plant for an even more beautiful display. To increase the size of the flowers or plants please call the store at 419/529-9739. This beautiful throw states,"When you saw one set of footprints... that was when I carried you." Price point one is presented folded with a bow and card. Price point two is displayed on an easel and price point three includes flowers or a plant for an even more beautiful display. To increase the size of the flowers or plants please call the store at 419/529-9739. 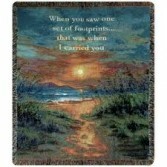 Thomas Kinkdade, painter of light, leads you to the serenity of the outdoors soaked in sunlight upon this tapestry throw. Isaiah 32:18 adorns the bottom of the throw, "And my people shall dwell in a peaceable habitation, and in sure dwellings, and in quiet resting places." Price point one is presented folded with a bow and card. Price point two is displayed on an easel and price point three includes flowers or a plant for an even more beautiful display. To increase the size of the flowers or plants please call the store at 419/529-9739. Spend your morning in the butterfly garden! 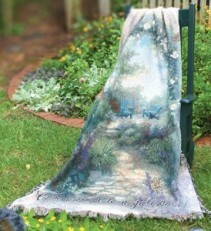 This beautiful tapestry will take you to a garden of peace as you follow the invitation of Christ to His apostles, "Come with me to a quiet place" (Mark 6:31). Price point one is presented folded with a bow and card. Price point two is displayed on an easel and price point three includes flowers or a plant for an even more beautiful display. To increase the size of the flowers or plants please call the store at 419/529-9739. This beautiful throw states, "The Lord is my shepherd; I shall not want.He makes me lie down in green pastures. He leads me beside still waters. He restores my soul. He leads me in paths of righteousness for his name's sake. Even though I walk through the valley of the shadow of death, I will fear no evil, for you are with me; your rod and your staff, they comfort me. You prepare a table before me in the presence of my enemies; you anoint my head with oil; my cup overflows. 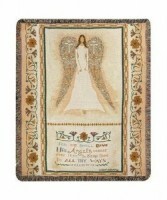 Surely goodness and mercy shall follow me all the days of my life, and I shall dwell in the house of the Lord forever." Price point one is presented folded with a bow and card. Price point two is displayed on an easel and price point three includes flowers or a plant for an even more beautiful display. To increase the size of the flowers or plants please call the store at 419/529-9739.